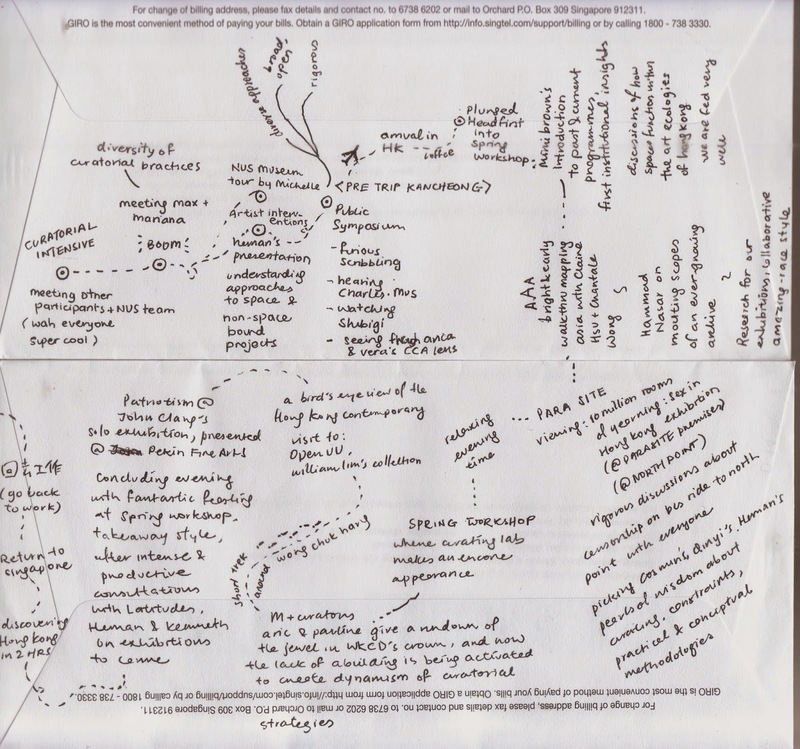 The map was my first attempt at summarising the first two and a half weeks of Curating Lab. While somewhat constrained by the breadth of two envelopes, the map format accurately reflects my sense of having been part of a Dérive, or what one might call a 'purposeful wandering', that had been in my opinion, masterfully designed for us eleven strangers to make our way through the landscape of contemporary curating. Contrary to Guy Debord's notion of psychogeography that takes place within the city of Paris, the first day of the Curatorial Intensive was a global tour led by Latitudes from the comfort of the National Library. From Amsterdam to Spain to London, and then the Interweb, the comforting, if rather dog-eared definition of a curatorial space as a solely physical one was elegantly rubbed off our maps. Curating Lab senpai Kenneth Tay's curator's tour of 'When you get closer to the heart, you may find cracks' made the exhibition pop, rendering a trajectory that successfully negotiated practical constraints visible to us, the seemingly effortless dérive within the exhibition space revealed as a product of carefully weighted decisions. Wonderwoman Michelle's thorough introduction to the NUS Museum and our Public Symposium (complete with packed hall) were rife with questions and new methodologies, rumblings of our fertile home ground, potent reminders to go design our own 'deh lee vehs' and generate our own start and finish lines. Whilst getting acquainted with the breadth and depth of Heman's expansive Moderations project, which straddled Spring Workshop in Hong Kong and Witte de With in Rotterdam, collaboration was foregrounded as a fundamental premise of production. It is only natural then, that the derivé (Hong Kong edition) was generously buoyed by Heman's chronic and infectious fondness for having people do things together. I leave you to trace or re-trace the paths that were taken on the Overseas Field Trip in my chicken scrawl of a map, pulsed along as we were from node to node, each one offering impeccably sophisticated modes of producing knowledge such that the reverie still holds sway over me. I'm happy to report in the meantime however, that the eleven strangers have gotten even stranger over these first two phases, but I'm of the mind that this bodes well for our 'deh lee vehs' of the future.